Late Breaking Abstracts: We are now accepting submissions for late-breaking abstracts! The deadline is November 13. Submit online. Registration: We plan to open registration for the Meeting in early November. Stay tuned for more information to come! Hotel Information: All official Meeting activities will take place at the Hilton Anatole. Make your reservation by January 5, 2018 to receive the discounted, group rate. Visit the hotel's website or call + 1 (800) 955-4281 and mention SMFM's 38th Annual Pregnancy Meeting. For Exhibitors: Download the 2018 Pregnancy Meeting Exhibit Prospectus for information on exhibiting, sponsorship, and advertising opportunities. You may also use the online exhibit application system to reserve your booth(s) and sponsorship opportunities! If you would like to be added to our exhibitor database, please share your contact information with Kara Shumaker, SMFM's Events & Exhibits Coordinator. 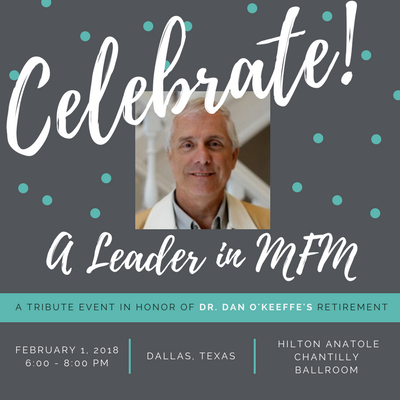 Celebrate Dr. Dan O'Keeffe: SMFM and the Foundation for SMFM will honor our friend and colleague, Dr. Dan O'Keeffe, at the annual Pregnancy Meeting. We are gathering for a tribute event to celebrate his career and his retirement as Executive Vice President of SMFM. We hope you will join us! Individual tickets as well as tribute packages are available, and proceeds from the event will help fund scholarships for the SMFM Leadership Academy for up-and-coming MFM leaders who will play a role in the future of our specialty. For Presenters: The SMFM Program Committee is currently in the process of reviewing abstracts. Expect to hear more about their selections in October 2017. SMFM has partnered with Make Signs for poster printing and delivery services. Visit their website to learn more about the cost of printing (10% discount for meeting attendees) with the additional benefit of being able to pick up your poster onsite in Dallas at the Hilton Anatole. No heed to haul your poster on the plane! BEWARE! It has come to the attention of SMFM staff that several companies are inaccurately representing themselves as SMFM's "housing vendor." These companies are contacting individuals in the SMFM community to solicit business. Specifically, they will offer to make hotel reservations within the SMFM room block on your behalf, or even offer a discount from the SMFM rate. This is a scam. Reservations should be made directly with the hotel using the instructions above. If you have questions about the hotel or think your have been contacted by one of these companies, please contact Terri Mobley, SMFM's Director of Meetings & Events. Are you interested in understanding how SMFM selects Annual Meeting cities? Find the details in the "You Asked, We Answer" section of our site, along with information about our advocacy efforts in Texas.